Some weeks ago, i posted about Nokia set to release their first android phone and today our waiting is finally over as the Nokia brand of android powered phones finally hit the Nigeria Smartphone market this week. But before i go any further let's take a quick look at the popular specifications of the phone before moving to the price in Nigeria. The Nokia X android phone is a dual SIM phone with gorgeous design and outlook, bright 4-inch screen and 800 x 480 LCD Display. Camera-wise, it has a 3MP rear camera with options that enable you alter the white balance in order to improve brightness in the dark. It has no flashlight. It has a very good processor. The Nokia X runs on the Qualcomm snapdragon S4 Dual core 1GHz Processor and the RAM is 512 MB. It also has 4GB storage that is expandable to 32GB via micro-SD. Lastly, you have little to worry about when it comes to battery life because Nokia rarely diasppoints on that as the Nokia X comes with a 1500mah battery that can last for 28 days on standby, 10.5 hours talk time and 4.5hours on browsing. 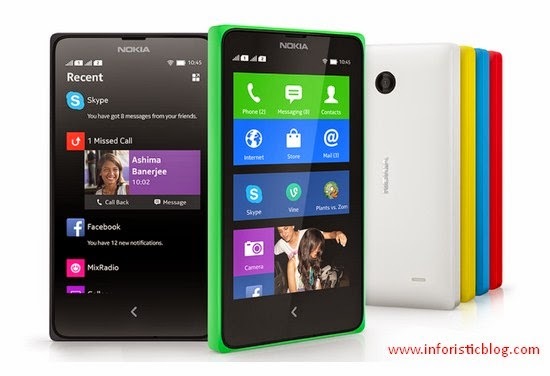 How Much Is The Nokia X in Nigeria? Buy Cheap Android Phones on Konga.com at Lowest price. Free Delivery | Pay on Delivery. NB: You won't miss out on our future updates if you subscribe with your email address, follow us on twitter or like our facebook page. Let's have your views and opinions, use the commentbox below this page and share this post as well. i want to buy the Nokia X but i dunno whether to buy it from Jumia or Konga, which one do you suggest please. Tanks for your earnest reply.